New York Wedding Photographer . Manhattan, NYC, Bronx, Brooklyn ðŸ’• love stories. Hi ! Are you looking for luxury film New York wedding photographer ? Family photosession while visiting Manhattan? Lets talk! I've met a lot of different people photographing weddings in New York with a lot of different look at getting ready process - should they have photographer capture those details or not... I think , well, you spend a lot of time and money and sometimes even more imagination for that day , you think it is important enough for all your family and friends to get here from all those places around the world to be with you at that day, you really want to look the best as it can be , you hired best wedding makeup artist and stylist in New York to make your parents teared up proudly when they will see how beautiful you are , you will have your best friends helping you or at least be with you those few hours before the wedding ceremony , and I don't see any reason why should you miss in your wedding album these "making beauty" fun with all those jokes, drinks, little moments that will make you smiling every time later when looking at those wedding pictures! Yeah, those photos with the bride looking the mirror are probably every wedding photographer trying to capture at getting ready part. Do I like all of them? No. Do I making them every wedding as "mast to have" photos? No. Most of the time Im trying do not interrupt in anything that going on in the room and let you forget that you actually have photographer here, and if I see that look - when you really asking the mirror with your eyes - how beautiful you are - for a second you stop seeng all that chaos around you and hold that moment for yourself - than I will be there to freeze it forever! That probably making difference between good and best wedding photographer - good photographer will setup that shot and it will be pretty good for sure, but best photographer will know that there will be a moment when he will need to press the shutter to make that lifetime image that will "WOW" your grandsons many years later- and he will capture that moment. There is another wedding photo of the bride getting make up . 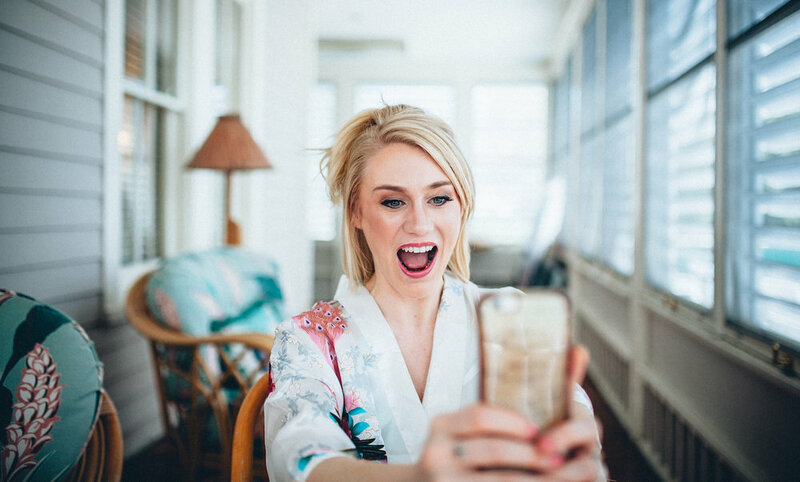 I did a lot of photos of her getting ready and was photographing something else when heard like some of bridesmaids finally agreed to let her see herself for a second at least with phone mirror - and I knew - I had to stop doing everything and be there at that second ! Another moment before the bride will open her eyes and will see how gorgeous she is - she was waiting for that moment not only few hours when was getting ready in that little nice old house, she was waiting for it few years , or maybe al her life , and it was just unacceptable for me as for wedding photographer to miss that exited moment ! Having wedding at Manhattan, Brooklyn, Queens, Bronx - lats talk about creating gorgeous wedding story ! Mishabook Photography. New york wedding photographer. One of those touching moments when your mother helping you with your wedding dress, cant miss it! Little different angle ) - bride with bridesmaids checking the wedding dress before help her to put it on for that moment she was waiting for so long! Everything has to be perfect! DAD, DO I LOOK AWESOME? READY FOR MANHATTAN BOY! My goal at that getting ready part of wedding day is to be at the right moment in right place and to catch those very short , less than a second moments that shows what you feel back than ,how important were those people for you and you for them, not just documenting all the process but create memories that will remind you how important your family is and how much you love them. To be honest , there is so many those small details and moments, fun and silly and sometimes sad , so it is really making the big part of the wedding memories you will be happy you did save ! And another thing since there is still enough time before wedding ceremony , everyone much more relaxed and stressless and we have some time for improvisation that give me big opportunities for creating awesome wedding photos for you! Thank you for looking, Misha, New York wedding photographer , don't forget to visit Mishabook Wedding Blog !